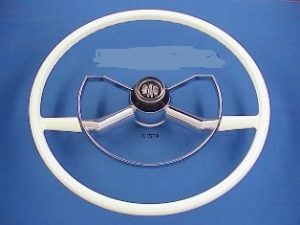 This 1951-1952 Chevy Butterfly Steering Wheel is a reproduction of the original GM steering wheel that was offered as an option on the Belair model and could be purchased and used on any other model 1951 or 1952 Chevy. Listed here is a reproduction that is offered in White. They are offered in Black also and will be listed later in Black. 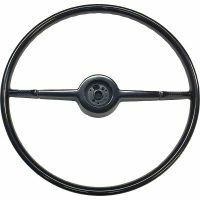 This new wheel is complete which includes the wheel, chrome horn ring, plastic horn button and horn parts under the button that makes the horn work.